Imagine spending $4 billion in today's dollars to dig a ditch four-feet deep and 40-feet wide. Is it any wonder why Thomas Jefferson described the concept of a manmade waterway linking the Great Lakes with the Atlantic Ocean as "little short of madness?" But as laborers slowly clawed shovels of earth from the ground in a 363-mile trek across the wilderness of New York State, they achieved one of the greatest engineering feats in American history. Oddly enough, it was accomplished entirely without the aid of a single professional engineer! 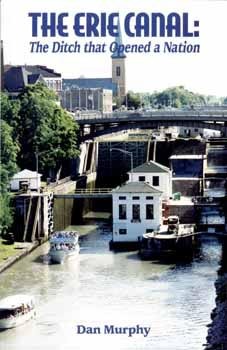 Despite its shallow depth, the Erie Canal carries a deep historical legacy. It was in canal towns like Lockport and Tonawanda where the doors of the American frontier were unlocked. A resurgence in interest in the Erie Canal has prompted Tonawanda journalist Dan Murphy to write a new book that is filled with riveting anecdotes and little-known facts. The Erie Canal: The Ditch that Opened a Nation is both entertaining and educational. The book includes more than 20 photos and a number of special user-friendly features. Scattered throughout the text are special boxes that answer "Frequently Asked Questions" about the canal. How do those intriguing lift bridges operate? What happens to the canal in the winter? How deep is the canal today? There are also special sections that highlight "Little Known Canal Facts." For example, not many people have heard the strange tale about the Medina fisherman who caught a piranha in the canal. Or that the creator of the "Wizard of Oz" lived in a canal town.